Blood Gas and Electrolyte Analyzers Market size was valued at USD 3.2 billion in 2017 and is expected to witness 6.8% CAGR from 2018 to 2024. Surge in adoption of blood gas and electrolyte analyzers in emergency wards, diagnostic centers and hospital settings is the key factor driving the industry growth. Point-of-care diagnosis has gained significant importance in the healthcare industry owing to its benefits including bedside care. Growing preference for compact and handheld blood gas analyzers that offer quick results and cater to operation rooms, emergency department services and critical care services will favor business growth. Moreover, availability of cost-effective and easy to transport portable blood gas analyzers will surge the adoption such analyzers in coming years. 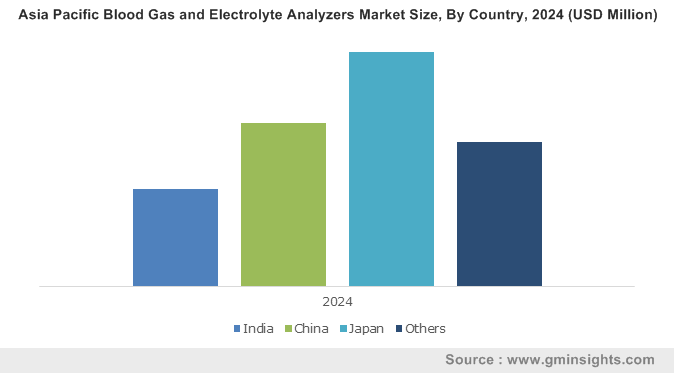 Increasing focus of key industry players towards development of advanced blood gas analyzers for improved patient care will further boost the blood gas and electrolyte analyzers industry growth. Furthermore, growing burden of chronic diseases such as diabetes, renal and cardiac diseases will render positive impact on blood gas and electrolyte business growth. According to the European Heart Network’s 2017 data, over 85 million people in Europe were living with CVD in 2015. Additionally, cardiovascular disease causes 3.9 million deaths in Europe each year. Adoption of unhealthy dietary habits coupled with rapidly growing elderly population base prone to chronic diseases will further augment the industry growth. 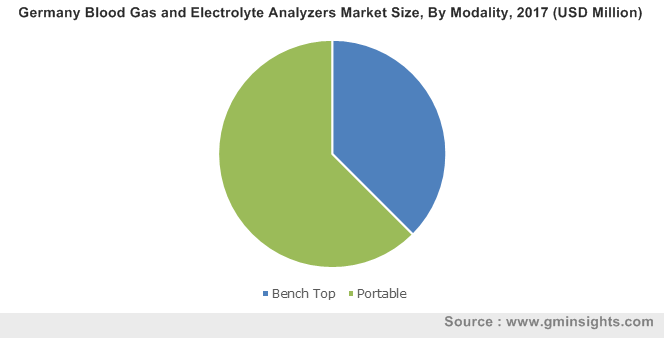 However, high cost of combined analyzers may impede blood gas and electrolyte analyzers market growth over the coming years. Combined analyzers segment accounted for 27.6% revenue share in 2017. Ability of combined analyzers to provide quick and accurate results for acid-base balance, blood gas, electrolytes, ionized calcium, lactate and glucose will increase its adoption in coming years thereby augmenting the segment growth. 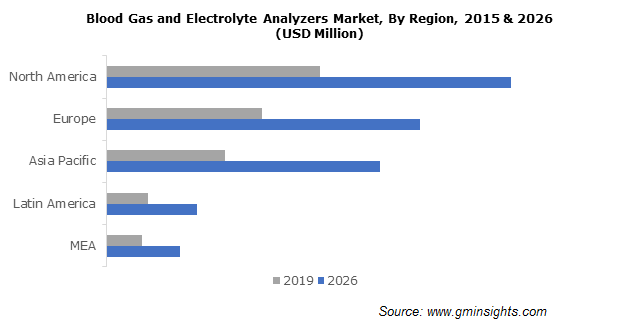 Electrolyte analyzers segment will witness significant CAGR of 6.0% during the forecast timeline. High segmental growth is attributed to rising usage of these analyzers for measurement of electrolyte levels in human body to measure cardiac and renal functions as well as detect metabolic imbalances. Portable segment held the highest revenue share of more than 60% in 2017 and is estimated to show similar trend during the forecast period. The segmental growth is attributed to high adoption of portable analyzers in near-patient settings. Increasing preference towards portable analyzers for reduction of preanalytical errors associated with centralized testing will further foster segment growth during the analysis period. Bench top segment accounted for considerable revenue in 2017 and is anticipated to show 6.3% CAGR during the analysis period. Utilization of bench top analyzers in clinical laboratories for arterial blood gas analysis will upsurge segmental revenue size. Benefits of bench top critical care analyzers including broad test menu, discrete biosensor technology and low cost of operation will increase its adoption in coming years. Point-of-care segment was valued at USD 1.4 billion in 2017 and is estimated to show lucrative growth during the forecast period. Increasing adoption of sophisticated, fast and stable point-of-care analyzers to provide acid-base measurements at the bedside will favor segmental growth. Use of blood gas analyzers in operation rooms and emergency departments to monitor mechanically ventilated patients is anticipated to upsurge revenue size. Diagnostic centers segment held substantial revenue share in 2017 and is projected to witness 6.7% CAGR over forthcoming years. Widespread applications of blood gas and electrolyte analyzers in disease detection and measurement of various elements such as pH, glucose, and sodium are expected to foster business growth. 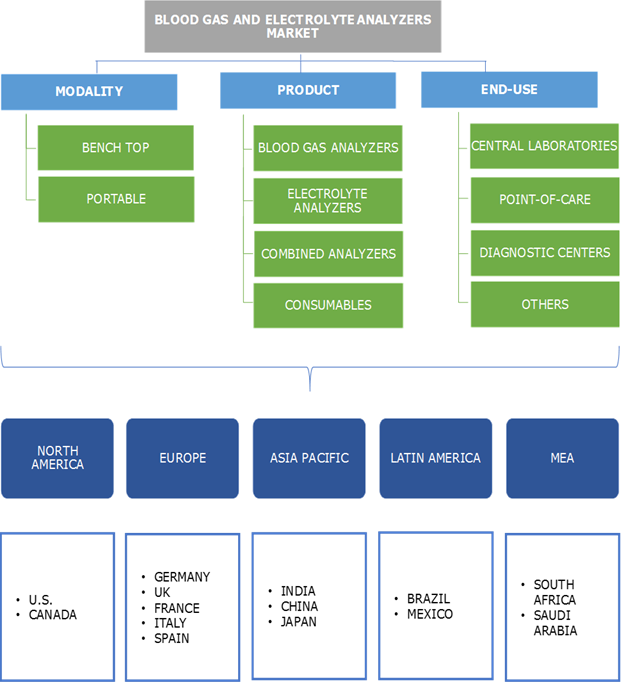 North America blood gas and electrolyte analyzers market dominated with 37.4% revenue regional share in 2017 and will witness similar trend during the forecast timeline. High market share is attributed to growing incidence of chronic ailments in the region. Growing number of heart attack and strokes will result into increasing patient pool in emergency wards and ICUs. Surge in traffic of emergency cases will create huge demand for blood gas and electrolyte analyzers. Asia Pacific blood gas and electrolyte analyzers market is estimated to witness substantial CAGR of 7.9% over forthcoming years. Regional growth is attributable to high prevalence of chronic diseases such as diabetes, blood pressure, hypertension. Furthermore, increasing awareness regarding disease diagnosis among the patient population and improving healthcare access for treatment will further accelerate business growth in Asia Pacific region. Some of the prominent business players operational in blood gas and electrolyte analyzers market include Abbott, Convergent Technologies, Dalko Diagnostics, Edan Instruments, Erba Mannheim, F. Hoffmann-La Roche, Instrumentation Laboratory (Werfen), Medica Corporation, OPTI Medical, Radiometer, Siemens and Tecom Analytical Systems. The industry players implement strategic initiatives such as acquisitions, merger and new product launch to uphold their market position and strengthen their product offerings. For instance, in March 2018, Roche received FDA clearance for the cobas m 511 integrated hematology analyser. The innovative product launch that features patented Bloodhound technology is aimed at addressing challenges of conventional hematology tests thereby strengthening company’s product portfolio. The history of blood gas and electrolyte analyzers can be traced back in 1957 with the development of the first blood gas analyzer measuring pH, PCO2 and PO2. Commercially blood gas analyzers were available in the mid-1960s and were basically used in clinical laboratories. By 1966, blood gas analysis was widely adopted in clinical settings, intensive care, anesthesia and surgeries. Later, the first combined blood gas and electrolyte analyzer was developed in 1985 that measured pH, PO2, PCO2, K, iCa, Na and hematocrit. Further, with the introduction of whole blood biosensors, blood gas analyzers evolved into complete critical care analyzers. These are capable of executing a wide menu including pH, PO2, PCO2, Na, Cl, K, iMg, iCa, glucose, hemoglobin, urea, lactate, hematocrit, O2 saturation, creatinine and co-oximetry. With intensely expanded abilities, the analyzers are now deployed routinely in critical care areas including surgery, ICU, NICU and ED. Extended test menus that aid usage of intensive care blood gas analyzers in various critical indications will surge its adoption in the foreseeable future.